The construction industry is vital to any national economy; it is also one of the most susceptible to workplace incidents. The unacceptably high rates of incidents in construction have huge socio-economic consequences for the victims, their families and friends, co-workers, employers and society at large. Construction safety researchers have introduced numerous strategies, models and tools through scientific inquiries involving primary data collection and analyses. While these efforts are commendable, there is a huge potential to create new knowledge and predictive models to improve construction safety by utilising already existing data about workplace incidents. 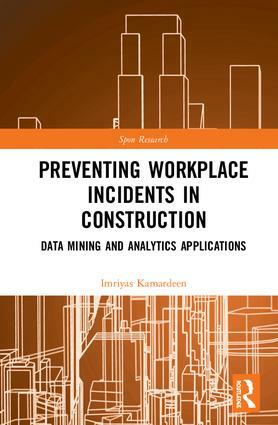 In this new book, Imriyas Kamardeen argues that more sophisticated approaches need to be deployed to enable improved analyses of incident data sets and the extraction of more valuable insights, patterns and knowledge to prevent work injuries and illnesses. The book aims to apply data mining and analytic techniques to past workplace incident data to discover patterns that facilitate the development of innovative models and strategies. Thereby improving work health, safety and wellbeing in construction and curtailing the high rate of incidents. It is essential reading for researchers and professionals in construction, health and safety and anyone interested in data analytics. Imriyas Kamardeen is Associate Professor and the Director of the Construction Management and Property Discipline at the University of New South Wales. He is also the Editor of the international journal Construction Economics and Building. His research and teaching interests predominantly lie in Construction Informatics and Workplace Health and Safety. He has authored two books previously with Routledge; OHS Electronic Management Systems for Construction (2013), and Fall Prevention Through Design in Construction: The Benefits of Mobile Computing (2015).